O'Keefe and Martin's Choice Furniture offers both Layaway and Financing. The layaway program is offered through O'Keefe and Martin's Choice Furniture. Simply come in to any one of our three locations, make a non-refundable deposit of 50% of your total purchase, then you can set up either weekly or monthly payments with your sales associate. Once your balance has been paid in full, then you can schedule pick up or delivery time. No interest, no fees, no background check. Just the cost of your furniture, in payments that work for you. 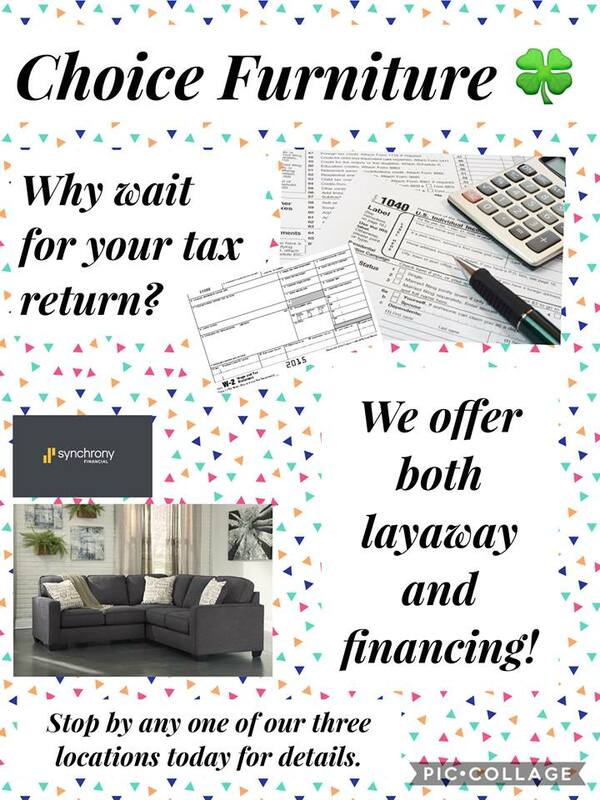 The financing program is offered through Synchrony Financial. You can come in to any one of our locations to fill out an application and be approved in minutes! Please bring two forms of identification when you come in. Purchases of $500 or more 12 months interest free! Please see a sales associate for details about interest rates beyond the 12 month period. Financing payments are made through Synchrony Financial, after approval you will receive payment information in the mail in 7-10 business days.